You can begin to offer your baby solid foods when he or she is ready, and your peditrication agrees. But, how will you know if your baby is ready for solid food? 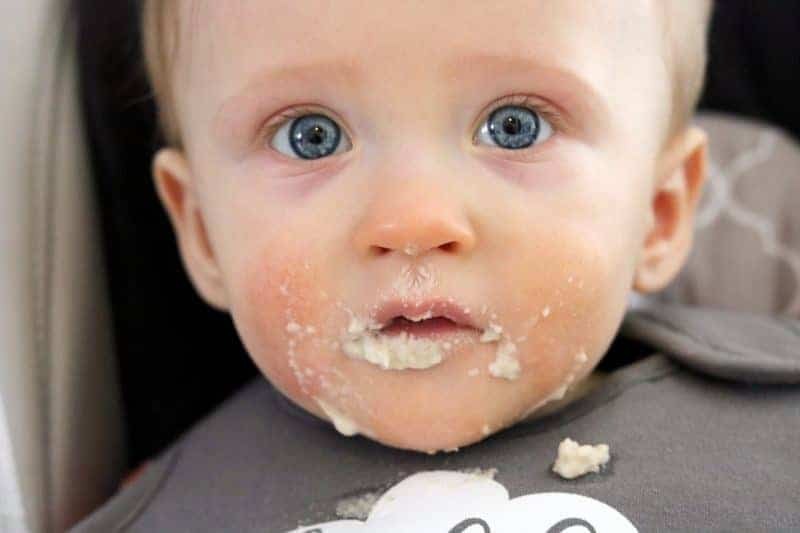 If your little one is showing these signs of readiness, and your pediatrician agrees, it might be time to introduce solid foods to your baby. What food do you introduce to baby first? Once you have made sure that your baby is ready to start solid food, you will want to begin by introducing simple single-ingredient foods. It is important to start baby with only single ingredient foods and to wait at least 3 days in between introducing additional foods. The reason behind this being that if your little one has an adverse reaction to a food you will know the cause. Our son's first solid food was Gerber Single-Grain Infant Cereal. Gerber Single-Grain Infant Cereal is an ideal first food babies. The cereal is packed with Iron, Zinc, Calcium, Vitamin C, E and six B Vitamins to help promote healthy growth and development. Iron is a key nutrient for babies that helps to support their brain development. While infant formulas are typically iron-fortified, breast milk isn't. 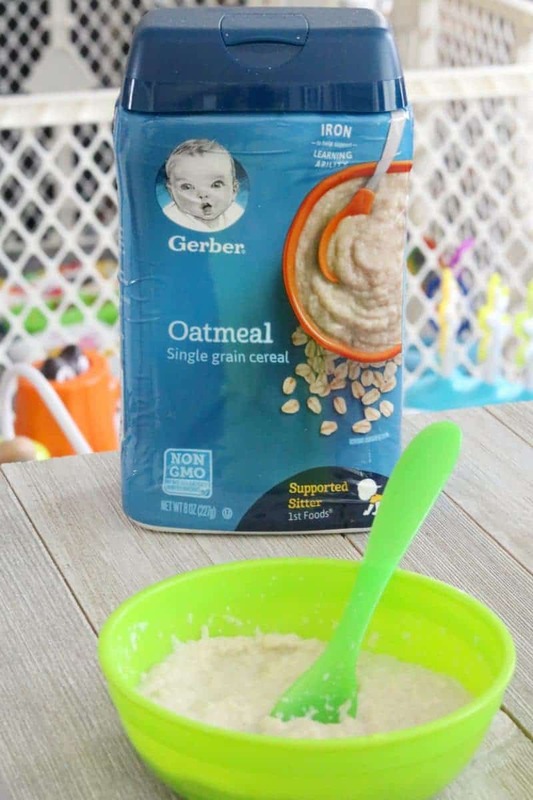 Gerber cereal is a great way for breastfeeding moms to help incorporate iron into their baby's diet. Gerber Single-Grain Infant Cereal is prepared by being mixed with either breast milk or formula (whichever your baby is on). At babies very first feedings you will want to use a higher ratio of milk to cereal than you will in the future. This is to make the cereal very liquidy and thus similar in texture to the breast milk / formula that your little one is used to. My little guy is now 8 months old (as of today!) and is used to eating solids, so we prepare his oatmeal thicker than we did when he had just started on solid foods. As soon as he sees a spoonful of Gerber Single-Grain Oatmeal coming toward his mouth, he opens wide for the spoon. He just loves his Gerber Single-Grain Oatmeal, and enjoys it each morning! Download and print out a valuable Gerber coupon here. 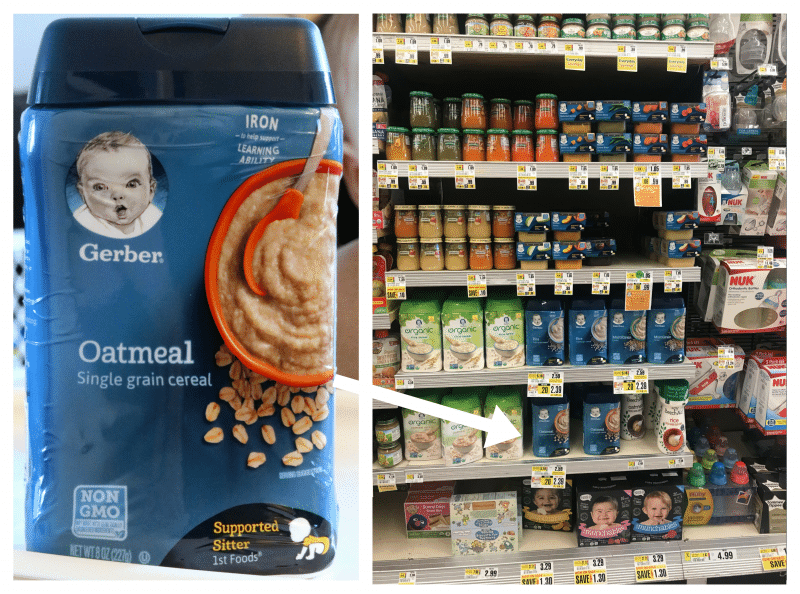 I usually pick up our Gerber Single Grain Oatmeal at ShopRite, but you should be able to find it in the baby aisle at your local grocery store. Do not be surprised if your baby refuses food at their first feeding. Babies are used to drinking their meals, not eating solid foods. It will take some time for your little one to get used to eating solids. Don't stress it or attempt to force you little one eat solid food if they refuse it. Offer the food and if they refuse, simply try again later. Or course, if baby refuses solid food for more than a few days or a week, or goes from accepting solid food to refusing it, you will want to talk to your peditrication. Offer baby a spoon to hold. My son is constantly trying to grab the spoon that I am using to feed him. And the bowl too! Sometimes he would cry when I wouldn't let him have the spoon. My mother suggested that I let him hold his own spoon during feedings, which was the perfect solution. Mothers really do know best! Now he can enjoy holding onto his own spoon while I am feeding him with another spoon. It is also worth noting that when you feed baby you should be using an infant sized plastic spoon with smooth edges. Don't try and feed baby with the stainless steel spoon you use to eat dinner! Don't underestimate the importance of a bib. Somehow my son always ends up covered in his baby food. Thank goodness for bibs! Without a bib I would be changing his outfit after each feeding for certain. 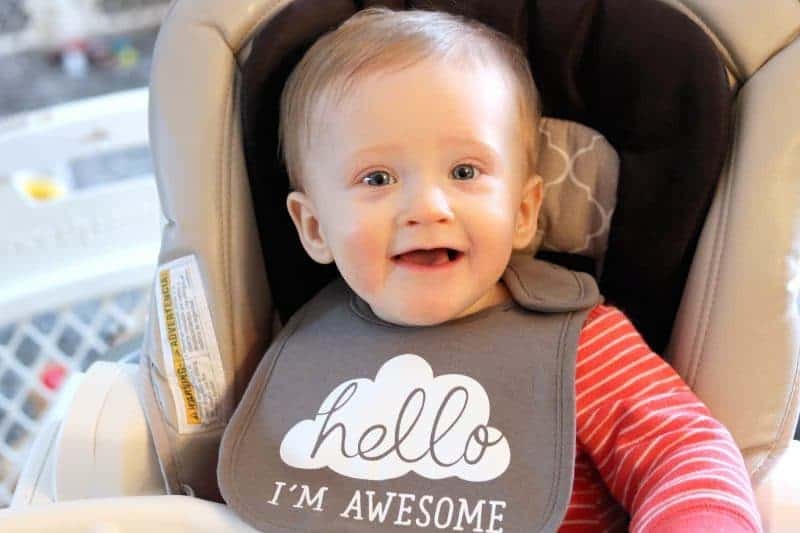 So, do yourself a favor and invest in several bibs for mealtime. 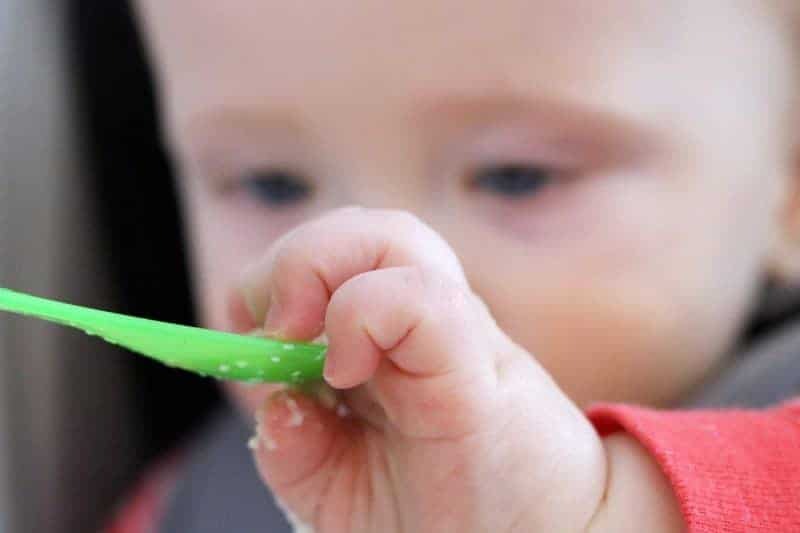 I hope that you found these tips on introducing solid foods to baby helpful, and that you and your little one are enjoying some happy feedings! Get more information on Gerber Infant Cereals here. Then, download a valuable Gerber coupon here to try the cereal with your little one. How did your first few feedings go with your little one? What solid food did you try first? Any feeding tips that I missed? Share your experiences with us in the comments below! I actually gave my son the Gerber Rice cereal as his first. I like Gerber foods all my kids had them. We actually added the oatmeal and cereal to several of the fruits and veggies. One of our daughters liked her food thicker so that worked great to add it in there. I’ll be sharing with my niece who just had a baby! This is all great advice! I wish I had had this information when my child was a baby. Talking with her doctor and trial/error were my go-to advice! My littles all grew up with Gerber. I remember that messy face so well when they were learning how to eat solids. It takes some practice, but getting those nutrients is so important. 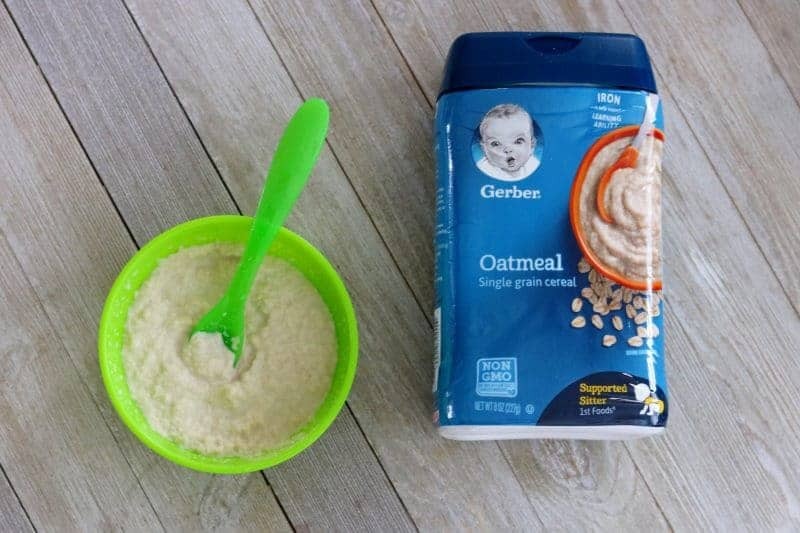 Gerber is the only brand we’ve used when introducing solid food to our little one and she loves it! I can also say boy was it a mess, lol! Food was everywhere but she didn’t care she was just happy to try something new. I love that Gerber has all the nutrients our babies need, that is very important when you start to introducing your baby to solid foods. This is awesome advice! I wish I had had this information when my son was a baby. I was a brand new mom with no family around…..loved your post!